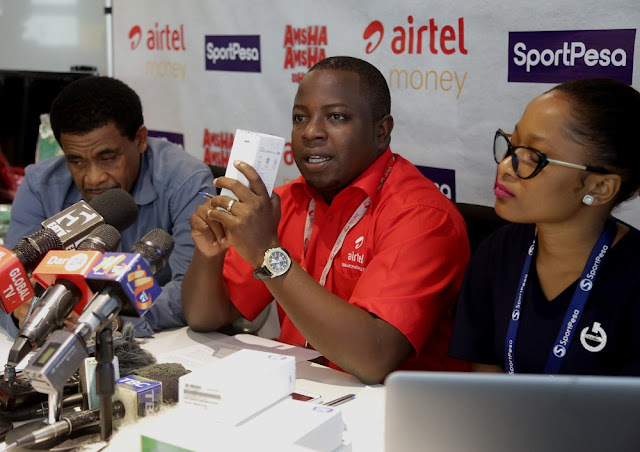 Airtel Tanzania the smartphone network in partnership with SportPesa has today announced the first winners of The “AMSHA AMSHA NA AIRTEL MONEY USHINDE” promotion which was launched on 14th June this year. The winners have won their prizes as a result of betting through Airtel Money. 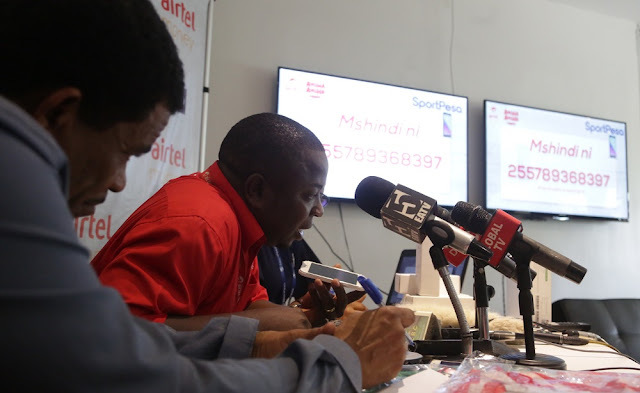 Speaking in Dar es Salaam today during a draw to announce the winners, Airtel Tanzania Public Relations Manager Jackson Mmbando said that the draw to select winners under the supervision of the Gaming Board of Tanzania which is authorized to control all gaming games in the country. As you can see, the draw has been open to everyone and is very fair which means every Airtel customer betting through Airtel Money stands a chance to be a winner. ‘ All what Airtel Money customer will need to do is simply place a bet within the promotion period to enter the draw, said Mmbando adding that customers must make sure that the SportPesa wallet is prefunded with funds for betting. 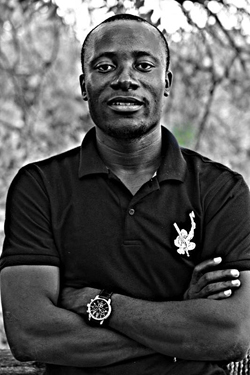 Mmbando said that the first winners of the draw are ten customers who have won each a brand new latest smartphone; ten others have each won original jerseys for Simba and Yanga Sports Club while ten others have each won a ticket to attend Simba and Yanga matches for the entire season of 2018/2019. I call upon Airtel customers to come up and participate to this AMSHA AMSHA USHINDE NA AIRTEL MONEY promotion as there are other many prizes yet to be won, said Mmbando adding that one customer has also won a brand new 32 inch color televisions. AMSHA AMSHA USHINDE NA AIRTEL gives an opportunity for Airtel to reward its loyal Airtel Money users through this consumer promotion. ‘Airtel has been introducing innovative services and products that are exciting and interactive to create a firm bond with our customers. We are aware of the love for sports and betting that has become a lifestyle for most of our customers, said Mmbando. Ms Msuya named prizes which are being won on daily basis as smartphones, Jerseys for Simba and Yanga clubs, match tickets to watch Simba and Yanga games for the entire season while weekly draws are 32 inch color televisions and Decoders from Star Times.All what a customer will be required to do is to enroll, top up SportPesa wallet using Airtel Money Waller and proceed to place a bet said Msuya adding that winners can collect their prizes from any Airtel Shop branch across the country. Airtel Tanzania Public Relations Manager Jackson Mmbando displays some of winning prizes that where won by winners of the first draw of the AMSHA AMSHA USHINDE NA AIRTEL MONEY promotion today in Dar es Salaam. He is flanked by SportPesa Public Relations Manager Sabrina Msuya – left and Tanzania Gaming Board official Ahmed Hemed. To participate, a customer will be supposed to dial *150*60# then transfer money to SportPesa wallet 150888 and press a bet. 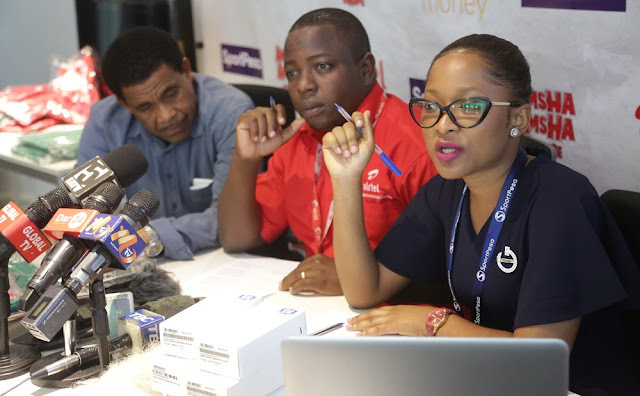 SportPesa Public Relations Manager Sabrina Msuya speaks during the first draw of the AMSHA AMSHA USHINDE NA AIRTEL MONEY promotion today in Dar es Salaam. She is flanked by Airtel Tanzania Public Relations Manager Jackson Mmbando - center and Tanzania Gaming Board official Ahmed Hemed. To participate, a customer will be supposed to dial *150*60# then transfer money to SportPesa wallet 150888 and press a bet. Airtel Tanzania Public Relations Manager Jackson Mmbando speaks to one of the winners of the AMSHA AMSHA USHINDE NA AIRTEL MONEY today in Dar es Salaam. To participate, a customer will be supposed to dial *150*60# then transfer money to SportPesa wallet 150888 and press a bet. He is flanked by Tanzania Gaming Board official Abdallah Hemed.